The Tata Nexon is neither a sub-compact SUV nor a hatchback on stilts. It’s a crossover in the true sense. The SUV traits of the Nexon are ground clearance, which at 209mm is comparable with the Renault Duster, and large 16-inch wheels. The high-stance is married with a coupe-like sloping roofline that rakes sharply like that of the Range Rover Evoque.The unconventional design is eye-catchy, which should make it hard to miss when parked beside other hatchbacks and compact SUVs. The top-spec XZ+ variant of the Nexon that we drove sported a contrast-colour roof in steel grey with both red and blue exterior colours. The signature element is an off-white plastic trim that runs just under the greenhouse on the side. It continues at the rear too, but that’s paint and not plastic. Tata could have done away with it, but then, they could have overdone it too, which they have not. Apart from the grey roof and off-white sash, there’s another contrasting element on the outside – the black plastic cladding. It does its job of making the Nexon look rugged and high-heeled quite well.Look straight into the Nexon’s eyes, and you’ll get a hint of Tata’s ‘Impact’ design. The front grille’s top line extends into the headlamps, and onto the side. That’s the ‘humanity line’ in Tata lingo. The Nexon’s design is, however, more aggressive than its siblings. The elements that add to the bold front look are pulled back projector headlamps with LED daytime running lamps, high-set fog lamps, a large front air intake and flared wheel arches.While the Nexon looks SUV-ish from the front, the rear is more hatchback-like. The high ground clearance is hard to miss, and the stock tyres (215/60 R16) look wide for a vehicle of the Nexon’s size. The faux skid plate on the rear bumper adds some ruggedness. There’s an off-white and glossy black element around the clear-lens tail lamps that adds quirkiness to the design, but you get used to it with time. The interior is filled with new techie stuff and the focus on quality and refinement is quite apparent. The highlight is what Tata calls the Grand Centre Console, which really pushes the boundaries of what we expect of a car in this segment. From the neatly tucked in handbrake lever to the sliding tambour door mechanism, everything looks and feels a few classes above.Then, there’s the first in segment Multi Drive Modes selector dial that lets you choose between Eco, City and Sport settings. The theme colour of the infotainment screen changes to match the driving mode you are on. Don’t get your hopes too high though – it doesn’t have any off road setting because the Nexon is a front wheel drive car. Unlike the exterior, the dashboard follows a simple and straightforward design. You get a floating 6.5-inch touchscreen that supports Android Auto. Tata says Apple Car play will be introduced soon. Infotainment system comes with the ability to read out text and Whatsapp messages and send replies using voice commands. The HD display offers intuitive interface and responds quickly. You can access all functions with minimal ‘eyes off the road time’. Nexon also offers a lot of niceties including the superbly sounding Harman music system, automatic climate control, navigation through the connected smartphone, voice commands for most functions, reverse camera and most importantly, a wearable smartkey. However, the steering wheel and the instrument panel have been carried over from the Tiago and Tigor. There are 31 smart storage areas including a huge glovebox, bottle holders and even umbrella holders on the doors to make the cabin very practical.The front seats are well padded for great comfort and support. Height adjustable driver seat and tiltable steering ensure finding a suitable driving position is not an issue. You would appreciate the elevated driving position and the excellent visibility in all directions. However, rear visibility is slightly compromised thanks to the small rear windscreen.There’s adequate legroom for rear passengers and despite the sloping roof, head room is generous too. Yet, the rear bench is not wide enough for three passengers. Centre armrests with cupholders and rear air vents make things more comfortable at the back.350 litres of boot space can be expanded to 690 litres by folding the rear seat on a 60:40 ratio. The Nexon will be offered with a new 1.5-litre, four-cylinder diesel engine and a 1.2-litre, three-cylinder petrol engine. Both engines come mated to class-first six-speed transmissions with power sent solely to the front wheels. Automated manual transmission (AMT)- equipped versions of the Nexon are under development and could be out by the year end.Tata’s new 1.5-litre direct injection turbo-diesel that also debuts on the Nexon puts out a healthy 110hp. A scaled-up, four-cylinder version of the Tiago’s 1.05-litre, three-cylinder diesel, the new engine fires easily with the first poke of the starter button. There is a bit of flutter at startup and some vibration is felt through the gear level but it settles down to a smooth idle. This motor is pretty refined even at higher revs and doesn’t make the same racket as the gravelly sounding 1.3 diesel in the Brezza.What’s immediately noticeable is how tractable the engine is; the Nexon pulls cleanly from as low as 1,400rpm. This tractability, due to the 260Nm of torque from 1,500rpm, makes driving in traffic quite easy and you don’t need to constantly downshift. Once you are past 2,000rpm, there’s a gentle wave of power and there’s no real spike like in the Brezza’s Fiat-sourced diesel. Post 4,000rpm, however, you hit a wall, and though the engine does rev to 4,500rpm, the drop in power at the top end is quite sudden. Unlike the Brezza’s unit which pulls well past 5,000rpm, the Nexon’s 1.5 diesel feels quite laboured at high revs. In fact, the lack of top-end punch and an average mid-range leaves you wanting for more power, even with the drive mode in the most aggressive ‘Sport’ setting.The Nexon’s high kerb weight of 1,305kg (110kg more than the Brezza) also blunts its performance to a great extent, and overall, we felt the Nexon could do with more punch. In a quick reference test, not done to our test standards, the Nexon managed to do the 0-100 run in 13.75sec, which is slower than the Brezza, at 12.9sec.The Nexon’s three driving modes, Eco, City and Sport, each with their own power and torque figures, distinctly alter the performance characteristics and have an impact on fuel efficiency as well. Sport mode, quite obviously, is the nicest to use, especially when extracting every ounce of performance but in the normal or City mode, performance is good enough for relaxed driving. In Eco mode, the Nexon feels particularly strangled and is only to be used if you’re running out of fuel or have exceeded your fuel allowance. The Tata Nexon comes with a dual path suspension and we must mention that it has been tuned very nicely. The suspension attacks potholes and bad roads with ease, without causing discomfort to passengers. The car remains pretty much stable even while going on broken patches at slightly higher speeds. The 16-inch tyres also have good grip levels. The steering is light at low speeds and weighs up nicely on the highways. It has decent feedback on offer and is pretty direct. Body roll isn’t much and I actually found the Nexon to be fun to drive. Braking power is good and ABS is standard across all variants. Tata Nexon comes packed with a plethora of safety features such as dual front airbags, Anti-lock Braking System (ABS), Electronic Brake-force Distribution (EBD), Immobilizer and Seatbelt with pretensioners and load limiters as standard. The high-end variants also boast of Park Assist with Camera, Front fog lamps with cornering assistance, rear fog lamps and speed dependent auto door locks features. The Nexon is a remarkable product from Tata; a bold crossover that combines standout form while packaging in immense practicality too, and if it weren’t for the the fit and finish issues, we would recommend it without hesitation. Especially the diesel. No kidding, the Nexon is likely to set segment benchmark on account of its very easy to drive diesel engine, and the big car levels of space in the cabin. On top of that, the Nexon is a neat and tidy handler and comfortable to be chauffeured around in too. The petrol is exciting when driven hard – but for everyday use you’d wish it offered smooth and more fluid performance. 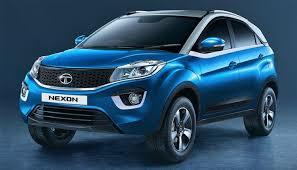 And, yes, the design is striking, and this Tata has all the features you need.